Added Note: This Booth is currently on Vacation. Thank You very much for your patronage. I've always loved Halloween. Selling the Spooky Flyers Online as well as in Local Shows, has given me the opportunity to interact with so many nice people. Years ago, we began creating Decorations for our own home. We decided to try selling them (my Husband and I working together on the Spooky Flyers). We were extremely thankful for the unexpected interest in these guys. Over the years, we would work to create a new design (there are 10 different styles of Boos to date). I love various forms of Art, as well. I've sold Prints of Celebrity Portraits, rendered from graphite pencil (some with a bit of charcoal). 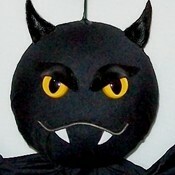 I've also created Dragon Fabric Sculptures and Porcelain Dolls. chill02wolfart doesn't have any items in their booth! Thanks for the help chill02wolfart. Have a great week. Hey Chill-thank you so much for taking the time to help me (in the “Promote” posts)-I hope you have a great day! Greetings, I would like to thank you for your compliment on my 1st HPL. I really appreciate your comment. This seller is delightful, always a pleasure to talk to. Very kind and a beautiful person! Need I say more? Cheryl is wonderful! One of the nicest ladies on Bonanza along with being so talented. She is so caring and always writing positive comments for other booths. I feel so fortunate that she is now my friend. Cheryl is one of the high spots of Bonanza — a totally professional seller, and a fun person as well. have you ever thought of flying Easter bunnies, or Santa flying through the air to delivery his packages the year all the reindeer took sick with the flu? Just kidding, of course. But I do hope you will continue to be here and share your unflagging cheer with us while you enjoy a long vacation. Cheryl is an absolute delightful seller to work with. It has been a real pleasure doing business with her! Very friendly and talented, great customer service and extremely fast shipping. I know that we will enjoy our “Boos” for many years to come! It has been a pleasure to buy a perfectly pleasing pumpkin flyer from Cheryl! From beginning to end, this transaction has been a delight! She is a very friendly spirit, one of the best on Bonanzle! This is one wonderful and talented seller! What a lovely person and Bonz booth owner, purveyor of Halloween Flyers, extraordinaire! The Flyers are so cleverly constructed with adorable and ghoulist facial expressions. I’ve heard that they’re a family project. I finally got around to order flyers – last year I missed out by making the decision too late. So, they arrived yesterday and I can’t wait for October to arrive to hang them on my front porch! But – WAIT – there’s more! Cheryl participates in the Bonz community dropping off positive vibes with her HPL feedback and booth chats. Thank you for your great comment on my first HPL. Very honest. I AM ENDORSING YOU AGAIN! FIRST YOU ARE A GREAT ARTIST AND A GREAT CRAFTWOMAN, AND THE BEST SELLER ON BONANZLE AS YOU ARE THE ONLY ONE AMONG US THAT SOLD OUT OF GOODS, FOR NOW, AND IN 1 MONTH’S TIME AND NOW THAT YOU ARE SOLD OUT, COME TO FLORIDA, WE WILL PAINT TOGETHER! Chill is an absolute delight! I love her warm sense of humor, her kindness and sweet spirit. She always makes me smile & laugh! What a joy to get to know her! I am so pleased to recommend her to you! Her artistic creativity is absolutely wonderful! From the Halloween Flyers she handcrafts to the dolls and dragons I have seen of her past work, Cheryl is a unique and lovely individual and I’m so honored to call her a friend! She has my highest regards! I have come to know Cheryl thru many conversations.This is a very positive, energetic and talented person. She’s lots of fun and very skilled in what shes does. Her halloween flyers are moving and they bring smiles to your face, and her celebrity portraits pop off the page with realism. What a talent and a fun personality.I am glad I know you..thank you for being you. This Delightful Seller will jump through all kinds of hoops to make sure you are happy (ecstatic!) with your purchase! You will not be disappointed in her great customer service, fun/fantastic products and the complete transaction!! We LOVE our Boos, and had such fun purchasing them, too!! Thank you!! Talk about positive energy!!!! Hopefully Cheryl’s optimism will rub off on me! I really appreciate her kind words & friendly spirit. It has been a such a pleasure meeting Cheryl and purchasing a couple of her wonderful Halloween Flyers. She is what Bonanzle is all about. When you bump into her on the Forums or in her Booth or during a sale, you end up feeling better than you think you should in a buying/selling environment. You have many gifts Hun…thank goodness you’re sharing them with us here on the Bonz! Anyone dropping POSiTiVE energY = definitely deserves my individual PERS0NAL eND0RSEMENT ~ Please take a moment to visit membersâ€™ (chill02wolfart) b00tH nextâ€¦MONTR0Se approves this message!